Borderlinx | Buy 525 America and ship worldwide with Borderlinx. Cheap rates guaranteed. 525 america is a thriving lifestyle brand whose hallmark is distinctive knit tops for women, renowned for comfort, color, diversity, and youthful attitude. In 1985, founder Bobby Bock had an idea for a sweater; a quality knitted top for women that was thick, rich, oversized, and produced domestically. It didn't exist. He set to work producing it, and in the 20 years since has transformed 525 America into the ultimate lifestyle brand for contemporary knitwear. "We are always catching the trend before it hits the curve and not after," says Bock, whose three company divisions feature styles that utilize the most current shapes and modern fabrics, and continue to pursue the "hip and comfortable" principles that have made 525 america appeal to women for two decades. 525 america offers shirts; cardigans, vests, dresses, jumpsuits and accessories perfect as your favorite essentials. 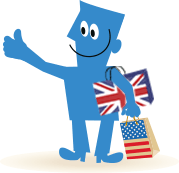 Now, customers internationally can buy 525 america in the USA and ship worldwide with Borderlinx! Using our shipping cost calculator, you can determine the cheap shipping, tax & duties upfront. A number of services are available through Borderlinx to make international ordering from 525 america hassle-free, including concierge, free repacking and consolidation services.